Today, world displacement levels are at an all-time high, with at least one person displaced for every 112 people around the world. With this as the reality, STAND is dismayed at the Trump administration’s announcement recently that the U.S. will cap refugee admissions at only 30,000 next year — an all-time low for the United States’ refugee resettlement program. Over the past several years, STAND has opposed continued iterations of both the Muslim Ban and previous resettlement cutbacks, and now stands fervently opposed to this move to further lower the U.S. refugee resettlement ceiling. Now, more than ever, such a decision represents a complete abandonment of the nation’s moral responsibility to host and assist those who have been forced to leave their homes due to conflict, atrocities, and natural disaster. According to the United Nations, today there are more than 68.5 million displaced people, including more than 25 million refugees. We cannot turn our backs on these, as one of the world’s most vulnerable populations. Facing the loss of their homes, families, and livelihoods, refugees look to the United States for a fighting chance at life. To restrict their entrance is to abandon the victims of global crises – crises that often the global community has failed to prevent. We, the young people of STAND, continue to support the fight against anti-refugee actions taken by the United States. 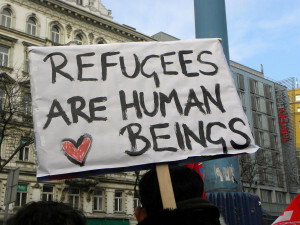 A country with such great wealth, potential impact, and history of humanitarian assistance, has a moral obligation to do their part and accept refugees from around the globe. As always, we stand #WithRefugees. This entry was posted in Burma, Burundi, Central African Republic, Conflicts, Congo, Emerging Conflicts, Refugees, South Sudan, Sudan, Syria, Yemen and tagged refugees, stateless people. Bookmark the permalink.